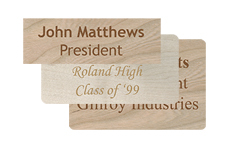 Engraved and full color name tags with your name, position, or other text. 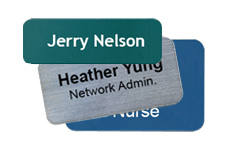 Magnetic name tags or traditional pin back or pocket clip nametag fastener to fit your needs. 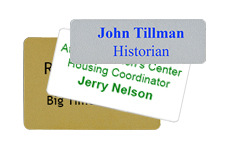 Choose from many high contrast color combinations for a truly custom name tag. names as you need them. Custom made name tags with your logo. Engraved logo name tags or full color logo name tags, depending on your logo design. Order personalized nametags with names on them or with your logo only to personalize them yourself. yourself nametags. Engraved or printed with your logo.